Lightweight library means “write less code and do more“, with this object of jQuery more feature using jQuery library can be improved. HTML elements of the document can be selected in different ways and is easy access to the elements to be enhanced. HTML elements can be applied style dynamically by manipulating their CSS properties or class names. jQuery supports to in-built events. Own event methods can be created to work on HTML elements and elements respond to different types events like click, mouse-over, mouse-out, change. The jQuery supports to built-in animation effects by which animation can be applied on the HTML DOM elements like fadding, sliding etc. jQuery helps to develop lot of features in Ajax technology and enable Ajax in web based applications to fetch the data from server without reloading a page. jQuery third party plugins having all kinds of smart widgets are used. jQuery is cross platform compatible, i.e. It is supported by many popular browsers like Chrome, Firefox, IE, Safari and others. jQuery is useful in HTML document like Event Handling i.e., clicking on links, mouse up, mouse down, Animating Effect, Traversing, Ajax Interacting and much more. jQuery makes the work of developers very simple in creating a simple web based applications and concise code. When larger web applications are developed with jQuery, some challenges may occur. jQuery provides number of features when working with the DOM in the HTML page. But it won’t allow many tools to structure the code as web app grows. 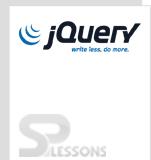 jQuery Overview chapter draws out the following main points. John resig developed jQuery in 2006.